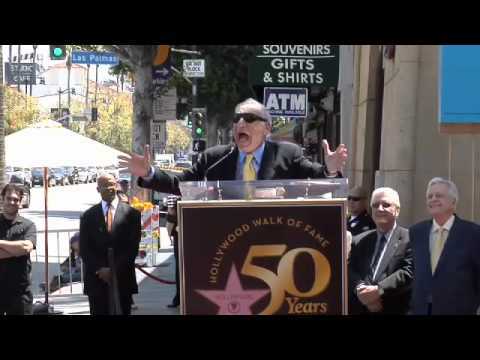 Mel Brooks was honored with the 2,406th star on the Hollywood Walk of Fame. Leron Gubler, President and CEO of the Hollywood Chamber of Commerce, presided over the ceremony. Guests included Robert Osborne, Max Brooks, and Carl Reiner. 6712 Hollywood Boulevard on April 23, 2010. Mel Brooks began his distinguished career during television's Golden Age as a writer for Sid Caesar on Your Show of Shows, the first of many comedy series for which he would write. In the '60s, Brooks teamed up with Carl Reiner to write and perform The 2000 Year Old Man albums, which became immediate bestsellers and Grammy winners. Brooks wrote and narrated The Critic, a short satire that received an Academy Award„¥ for Best Animated Short Subject in 1964. In 1965, he teamed up with Buck Henry to create the long-running television series Get Smart. In 1968, he wrote and directed his first feature film, The Producers, which earned him an Oscar® for Best Original Screenplay. It later became the basis for the hit Broadway musical and subsequent film version. Brooks has created a remarkable string of hit comedies: The Twelve Chairs, Blazing Saddles, Young Frankenstein, Silent Movie, High Anxiety, History of the World Part I, To Be or Not To Be, Spaceballs, Life Stinks, Robin Hood: Men in Tights and Dracula: Dead and Loving It. Like The Producers, Young Frankenstein also made a successful transition to the Broadway musical stage. Brooks' visionary film company, Brooksfilms Limited, has produced some of America's most distinguished films, among them David Lynch's The Elephant Man and David Cronenberg's The Fly. For three successive seasons, Brooks won Emmys for his role as Uncle Phil the series Mad About You. Last year, commemorating his lifelong contributions to American culture, Brooks was named among the recipients of the prestigious Kennedy Center Honors.